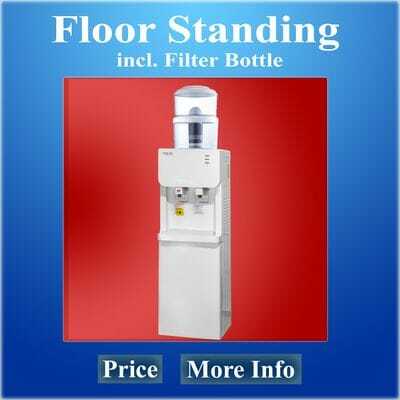 Water dispenser Townsville has been supplying filtered water coolers for over 20 years now. Our 3 modern looking and high standard quality of our products are the best in the market. 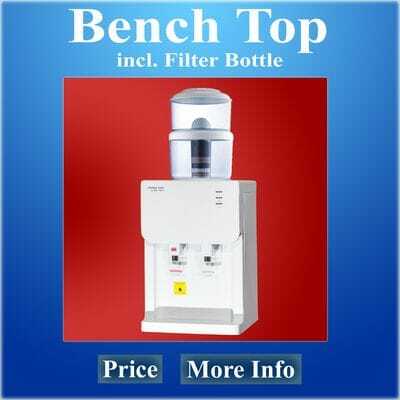 Please find here Bench Top water dispenser Townsville, Floor Standing water dispenser Townsville and our Stainless Steel water dispenser Townsville. Each of the water dispenser Townsville models have their own features, the Bench Top model for home and small offices up to our Stainless Steel model for home and larger offices, fitness centers, schools, and more. 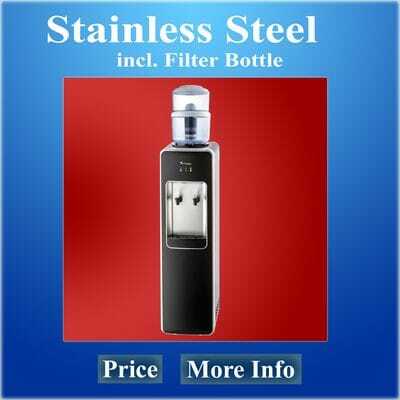 All models comes with a filtration bottle including a 7-stage filter cartridge. There is no plumbing required and you only need 1 power point. To fill the filtration bottle only remove the lid from the bottle. Fill up a jug from your tap and poor in the tap water into the top compartment of the bottle. All the water will be filtered with our filtration bottle. . This filter bottle will remove chemicals from your tap water such as chlorine, organic sediments, heavy metals, and more. The filter cartridge will also add some very important minerals back to the water. So now you and your family or staff can enjoy unlimited great tasting water free from your own tap. You can refill the bottle as often as you like and you will never run out of drinking water. Never spend any money on bottled water again! Drinking healthy water will help maintain the balance of your body fluid. Approx. 70 % of your body is water so you can understand how important it is to drink a good quality of water without all the chemicals you find in tap water. A good level of these body fluids will help for better digestion, maintain of body temperature, circulation, and heaps more. Drinking 8 glasses of water each day is a good indicator. If you exercise of are in some hard work you could drink more water. Normally your body will tell you when to drink. If you want to lose some weight start the day with drinking 2 glasses of water before breakfast. Drinking water is easy if the taste is good and therefore we recommend to drink proper filtered water. You can add a slice of lemon to the water. By doing this you get filled up with water and this will help to lower your calorie intake. Prestige Water recommends to drink mineral water and you can drink this by filtering your tap water through the filter system from water dispenser Townsville.